The band „Calender“ from New Jersey was founded in the 70s by Paul Kyser. Besides his activities as songwriter, arranger and producer he set up his label Pi Kappa Records. The band’s only album „It’s a Monster“ was released on this label in 1976 and has grown into a legendary status over the years and is appreciated by fans and collectors alike. 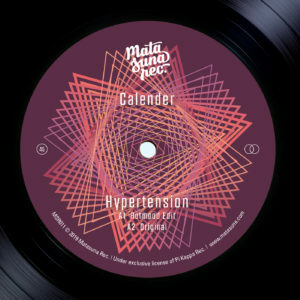 The opener „Hypertension“ is a disco banger par excellence. Kyser’s sophisticated arrangements merge thrilling grooves, elegant strings, varied funk elements and soulful vocals to a great and unique joint for every dancefloor. It’s very pleasing that the song doesn’t get overloaded or cheesy, as it’s often the case in disco music. On the flipside, „Ritmo Latino“ takes a different musical direction. As the name suggests, there are all kinds of Latin American influences to be heard: the brass section, rhythm parts, piano sounds and the grooving bass line, which goes straight into the veins. Nevertheless, the song is also strongly rooted in funk & jazz and inspires its listeners with its unique character.